Wow - you took some serious liberties with what he said. First, he did not say anything that is not true. Amanpour has about as much objective credibility as Maddow - she simply had him on to make fun. In this case, she is the joke. As are you JW. I read the interview, and other than Franklin having huge pieces of cause-and-effect in history backwards, I have to say - I don't recognize the "brand" of Christianity Franklin is talking about. Except for one part. I agree that only God can see one's heart. The rest of that sentence should be, "and the rest of us had best lay off judging." I saw both his interview with Amanpour, where his self-declared integrity didn't quite shine through, but better, his interview with Lawrence O'Donnell, in which he again asserted that he doesn't know if Obama is a Christian since he can't see into his heart, but wouldn't say that it was impossible to make that judgment about others, i.e. he could recognize his political cronies (like The Donald, I guess) as good Christians like him, but not that feared Socialistic capitalist, Obama. I at least give Graham credit that he admitted that he's never voted for a Democrat for president, although he said that he has voted for some good Democrats in NC - I'm thinking Jimmy Hodges maybe, since he's a realtor and that would be consistent with his brand of Christianity, I think? Best, he refused to agree with Jesus' explicit repudiation of material wealth. That might interfere with his self-image, I guess. I have always felt Billy G. is/was a great messenger when it comes to sharing the Gospel of Jesus Christ. He has graciously stayed out of the political arena, admiting the mistake when he openly supported Richard Nixon. From all I have read, I believe Billy would be dissappointed in the "road" his son has chosen. Obviously Franklin has not learned too much from his father. He will continue to divide Christians when he "draws the line" in politics, not to mention his claim that Islam is wicked and evil, then he wonders why the White House prefers him not to go over to Baghdad and pray. I deeply question his intentions and purpose. Religion is some of the Devil's best work! 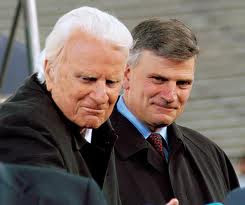 As a Christian I am deeply concerned at the message that Franklin Graham is sending the Nation. That he would support a "good Christian" like Donald Trump (had affairs, multiple marriages, excess that would make Jesus blush, etc...), but would not even entertain that Obama is a Christian (Stable marriage, no affairs, relatively low key as compared to how he could live). This is why people reject Christianity. Franklin is going to lose as many to the Christain faith as his dad brought to the faith before it's all over. Sad.